The banking giant distances itself from bizarre, disgusting stunt. These days, big banks have plenty of PR problems thanks to their well-deserved reputations of taking risks with the public’s money and getting golden parachutes after tanking the economy. 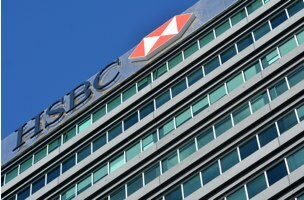 No exception to the rule, international banking giant HSBC has recently been dodging bad press over a money laundering scandal. But today, the company is taking heat for something far more bizarre. Yesterday, British newspaper The Sun shared a video online, reporting that it had been filmed at an HSBC corporate team-building event and posted by its creators on Instagram before being subsequently deleted. In the frighteningly familiar scene, a man in an orange jumpsuit kneels, while five men in black balaclavas stand behind him, one of whom is holding a coat hanger as a mock knife over the faux victim’s head. Then, a shout of “Allahu Akhbar” is heard. While the bank has has taken the best (really the only possible) course here, we imagine the outrage will continue to build for a little while as news of the horrific performance spreads. How anyone could think such a thing would be funny is beyond imagining, and how a corporate team-building event could devolve into such depravity is equally baffling; maybe stick to trust falls next time.